Preston Marshall is a Director, Information Science Institute at the University of Southern California's Viterbi School of Engineering, where he leads research programs in wireless, networking, cognitive radio, alternative computing, and related technology research. Research Projects Agency (DARPA), where he lead key cognitive radio and networking programs, including the neXt Generation Communications (XG) program, Disruption and Delay Tolerant Networking (DTN), Sensor Networking, Analog Logic, and the Wireless Network After Next (WNaN) program. These programs demonstrated the viability of key aspects of cognitive radio technology, including Dynamic Spectrum Access (DSA), adaptive wireless networking, content-based networks, and low cost, multi-transceiver adaptive networking, and probabalistic-models of signal processing. He has numerous published works, and has many appearances as invited or keynote speaker at major technical conferences related to wireless communications. He is the author of "Quantitative Analysis of Cognitive Radio and Network Performance", due to appear in July 2010. 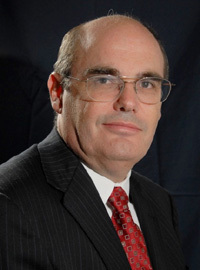 He was awarded the Software Defined Radio Forum's 2007 Annual Achievement award, the Defense Superior Service Award in 2008, has been a guest editor for IEEE Proceedings, and chairs the Steering Committee for the IEEE International Symposium on Dynamic Spectrum Access Networks (DYSPAN) Conference. Dr. Marshall holds a PhD in Electrical Engineering from Trinity College, Dublin, and a BS in Electrical Engineering, and an MS in Information Sciences from Lehigh University, PA.